been disconnected. Can someone confirm the status of this arm? Photographer Roger Marsh; copyright J K Wallace, all rights reserved. The LMS, LNE and Southern Railway companies all adopted upper quadrant arms. 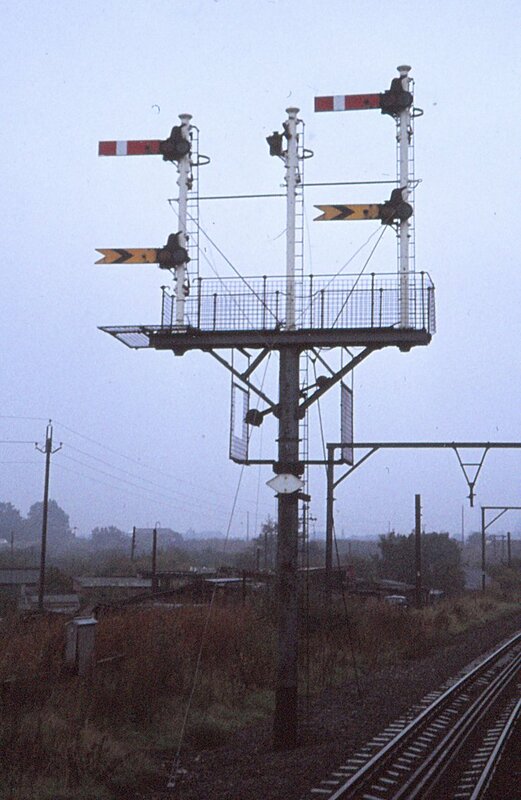 Early in the development corrugations were formed in the surface of the signal arm to strengthen it. However it was discovered that a folded edge was just as effective, and cheaper to produce. The LMS and LNE seem to have replaced their corrugated arms at a relatively early stage. However the Southern continued to use them much longer, and in particular for the 3 foot subsidiary arms. 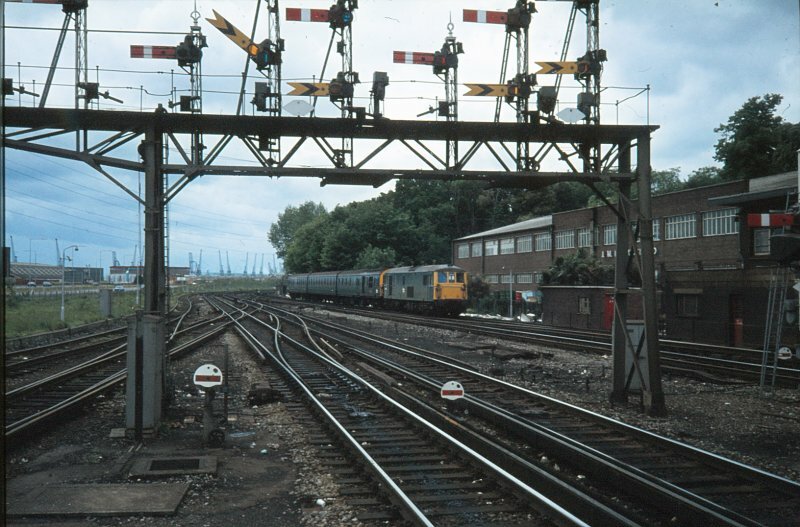 This photo of the Down Starters on their gantry at Southampton Central station in the Blue electric period shows at least two arms are of the corrugated pattern - interestingly it is only Home signals that are of this type. All the distants are of the later the folded edge type. The gradual upgrading of arms is perhaps more apparent on this gantry, as it has a goodly number of arms and has been regularly photographed over the years. A shot taken on 1 April 1967 shows the second 'doll' (post) from the right sporting two corrugated arms, whereas 7-or-so years later, they have both been replaced with the folded-edge type. In 1967 the third doll from the right had a corrugated arm - as does the later view - but it featured a white circle attached to the arm indicating a lesser routing. The fourth and fifth dolls in 1967 also had corrugated arms, which have been upgraded in the later view. Another small but significant change is the attachment of the track circuit diamonds - these are missing from the 1967 view.